No sooner had Fred Matiang’i retained his spot in Uhuru’s cabinet than he got down to doing what he does best: Streamlining. The Interior CS has ordered that all staff at the Jomo Kenyatta International Airport(JKIA) undergo a mandatory customer care training. 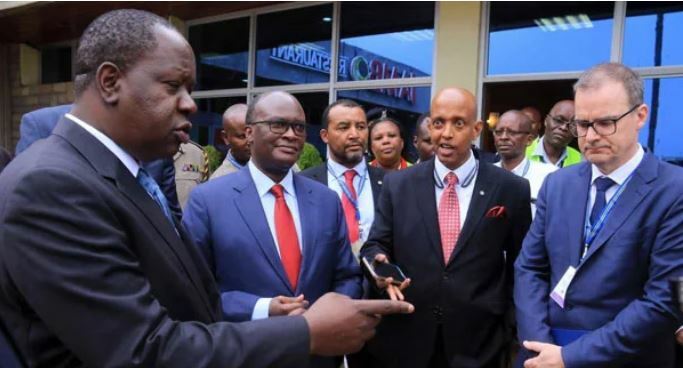 Matiang’i was among three Cabinet Secretaries who made an impromptu visit to the airport at around 5.30am on Wednesday. The others were Transport CS James Macharia and Najib Balala(Tourism). The visit came days after Kenyans complained on social media about long delays at the international arrivals section. Many noted that a large number of immigration and customs desks were unmanned, resulting in crowding at the airport. The CS said everything must be done to ensure operations at Kenya’s largest airport are streamlined. “All airport staff will undergo customer care training at Utalii College, a seven-day crash programme to ensure that we improve service delivery,” he said. Matiang’i further ordered the vetting of taxi operators at JKIA, saying the sector must be streamlined in the next 100 days. The government is keen to improve services at JKIA after it was granted category One status, allowing for direct flights to United States.